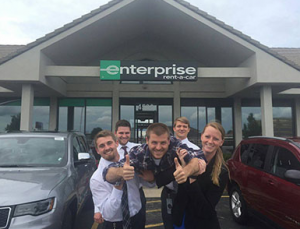 As college students head back to campus, about 2,000 students will enter academic halls with more knowledge than they could have learned from any textbook this summer — because they gained real-world experience by completing the Management Training internship program at Enterprise. Take it from Management Intern Mitch L. Now a senior at the University of Wisconsin Oshkosh, Mitch is grateful his experience surpassed his initial expectations. The internship — which follows the model of the Management Training (MT) program — shows college students what it takes to run a successful business. They cultivate entrepreneurial skills, develop marketing strategies, build business-to-business relationships and complete special projects. For his project, Mitch made a video detailing the differences between good and great customer service. And what’s his takeaway? “Good customer service doesn’t matter unless it’s great,” Mitch says with enthusiasm. Approximately 2,000 students completed the MT internship program this year. Enterprise works to bring on approximately 50 percent of those who are eligible back to the Management Training program upon graduation. One of those interns is Shirley C. The Boston native and Bryant University of Rhode Island student completed a summer internship at Enterprise’s largest branch in San Antonio, Texas. Like Mitch, Shirley joined as an employee referral because she’d witnessed someone else’s success. Even though she’d only heard about Enterprise being a great place to work in Boston, Shirley quickly found out that what sets the brand apart among other employers extends beyond state lines. Does Mitch look familiar? He was the grand prize winner of this summer’s Enterprise Careers #internchallenge on Facebook.